Around ten days back the Commonwealth Games Village was described as 'filthy' and 'uninhabitable'. 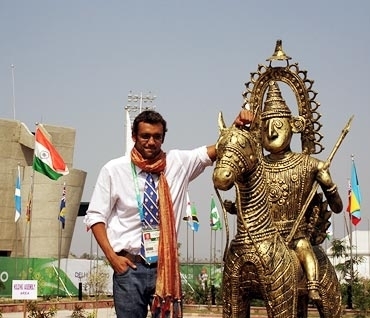 Now, every athlete, including our correspondent Harish Kotian, is falling in love with the place. Around ten days back the Commonwealth Games Village was described as 'filthy' and 'uninhabitable'. Now, it seems every athlete is falling in love with the place. Hectic work over the last couple of weeks has seen the organizers turn around things in style. Many of the foreign athletes are describing the Village as one of the best they have ever witnessed. England's badminton ace Nathan Robertson, a veteran of three Commonwealth Games, says the accommodation is the best he has ever seen. "We have been here two days now. We all saw reports a week ago back in England about the Games Village. But I must tell you that the village quality is very good and the food hall is excellent. The accommodation is possibly the best that I have ever stayed in. It was a little dirty when we arrived but the actual accommodation is some of the best we have stayed from the previous Commonwealth Games," he said. Robertson, who won gold in the mixed doubles and silver in the team event at the 2006 Melbourne Commonwealth Games, said it was a pleasant surprise to find things in order. "It was a little dusty when we arrived because a lot of work was being done last week, like cleaning up the apartments. But that is really a minor problem as compared to what we saw in reports a week or so ago," he said. 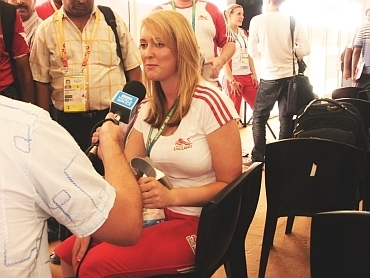 Another English athlete, Danielle Brown, who has to use a wheelchair because of a disability, also gave the thumbs-up to the Games Village. The 22-year-old archer said all arrangements for handicapped athletes too have been taken care of. "The wheelchair accessibility and the rooms are absolutely fantastic. Last year at the World Championships we could not even get the wheelchair through the bathroom doors, so all the guys were in the wheelchair permanently. So, if you had to use the toilet in the middle of the night, you had to wheel down to reception, which was just a complete pain. Around the Games Village there are a few bumps that are difficult to get over but mostly it is absolutely fine," she said. India's chef de mission Bhubneshwar Kalita said he had never witnessed facilities as classy as in Delhi, be at the Olympics or Asian Games. "I have attended many big events, like the Olympics, Asian Games, Commonwealth Games and Youth Olympics, but the facilities that we have got here are above all of the them. The accommodation, food, transport facilities, the service centres, the communication facilities are all of high standards and have surpassed all the other Games that I have witnessed, like the 2002 Manchester Commonwealth Games and the Youth Olympic Games in Singapore last month," he said. Kalita, who is also a Member of Parliament, said in some Games the athletes are made to stay in university hostels but Delhi is providing them world-class apartments. "The apartments are some of the best rooms that I have ever seen. I remember during the Manchester Games we were put up in college and university hostels. Even in the Singapore Youth Games, the athletes were put up in university hostels. If you compare that to the Delhi Games, you will see some of the best rooms and best facilities that the athletes might have ever come across." Athletes from countries like Malaysia, South Africa, Canada and even neighbours Pakistan are lauding the facilities at the Village. "The toilets flush, the showers work, the beds are good, so we're happy," New Zealand hockey skipper Phil Burrows was quoted as saying. Another batch of around 1200 athletes and officials are expected to check into the Village on Friday, swelling the count to nearly 700 inhabitants. The dining area, which is open 24x7, serves cuisine ranging from Indian, American, Continental, Italian to African from a menu of nearly 120 items. The dining area, managed by US-based company Delaware North, has nearly 2500 people working round the clock to ensure a good experience for the athletes. The village, situated next to the Akshardham temple on the banks of the Yamuna river, has 1100 flats in 34 towers to accommodate the athletes. When they are not practicing or competing, the athletes can spend time around the Games Village visiting facilities like shopping centre, beauty parlour, post office, bar, bank, gymnasiums and swimming pools. 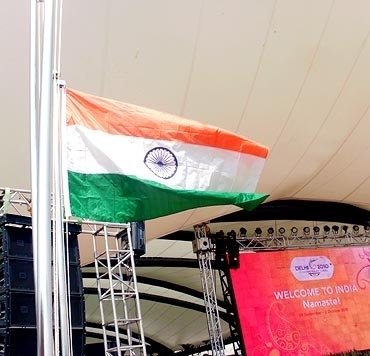 Meanwhile, the Indian tri-colour was hosted at the Games Village on Friday in the presence of a large chunk of the Indian contingent. The Indian tennis players, hockey team, badminton team and shooting team were conspicuous by their absence because of their practice sessions. Children from different schools sang and danced to entertain the Indian athletes, who appeared in a hurry to get back to their rooms and escape the wrath of the burning afternoon sun. Several other teams also had their flag raising ceremonies amidst various cultural programmes by school children from around Delhi. Meanwhile, Organising Committee media committee chairman Tarlochan Singh declared the opening ceremony would one of the best events ever staged. "The whole ceremony is divided into seven segments, with the first being the Swagatam. 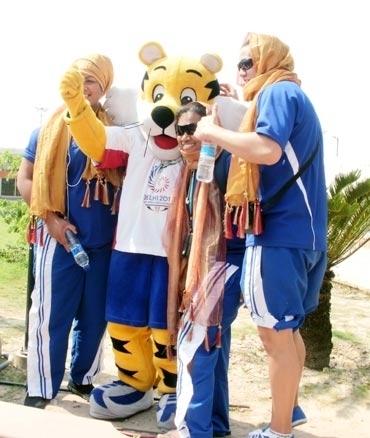 7000 artists will be performing in the opening ceremony which will be attended by 60000 spectators," said Singh. The seven segments are: Swagatam, Rhythm of India, Great Indian Journey, Celebration, Yoga, Puppets and Knowledge Tree. 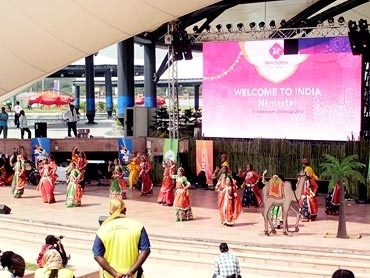 Swagatam is a welcome song and would be presented by school kids from Delhi followed by the Rhythm of India show that will see nearly a 1000 drummers performing. The Great Indian Journey will showcase the various cultures of the country through a special train journey. The celebration would be a huge dance show, followed the Yoga and Puppet shows.